Is there an easy way to understand what is happening in the markets related to China? effectively.... and this is corroborated by several news reports, a large amount chinese retail investors were day trading. Now, seems most have called it a day and the government is making efforts to prop up the market. This is obviously a huge oversimplification but, effectively, retail chinese investors headed for the exit door en masse. staustin wrote: effectively.... and this is corroborated by several news reports, a large amount chinese retail investors were day trading. Now, seems most have called it a day and the government is making efforts to prop up the market. It should be point out that a lot of the craziness is in A shates. If you look at the market it had like a 60% gain in 2 months before giving it all back. China is a Communistic country. The United States is a capitalist society. I think that pretty much explains the difference between China and the rest of the world. It didn't work well in Russia, and it isn't working well in China either. China is a frontier economy, the real wild west where everything fake is posted as real by the powers in office. It's a puppeteer economy. How's Alibaba doing this morning? Grt2bOutdoors wrote: China is a Communistic country. The United States is a capitalist society. I think that pretty much explains the difference between China and the rest of the world. It didn't work well in Russia, and it isn't working well in China either. I have some sympathy towards China. When I look at China I see a cup half full, not half empty. China is a hybrid society – moving from socialist to a capitalist society. China's leaders on one hand know of the power and efficiencies that capitalism can bring. They also know the chaos that it can bring – see Russia and Eastern Europe. They also don't fully trust the market yet. So we get these jerky movements. A year ago they were promoting the stock market as a way to handle surplus savings. Now they are discouraging it because it is in bubble territory. Just think about China stock market as one that is played by all traders and no institutional or individual investors. Anything goes up must go down there, for sure. Because everyone wants to make quick money and nobody is interested in long-term investment. I keep thinking of the 60 Minutes piece a year or two ago where Leslie S. walked through entire cities with freeways and skyscrapers and shopping malls with no one living in them (ghost cities in other words). Citizens bought real estate and speculated. It was appalling. You could see then that this was a faux economy. Looked like Ireland in the Celtic Tiger days but ten times worse. I gather when the gov. cracked down on buying multiple properties, people switched their investing to the stock market? Thanks for the links to articles. alex_686 wrote: I have some sympathy towards China. When I look at China I see a cup half full, not half empty. Completely agree. 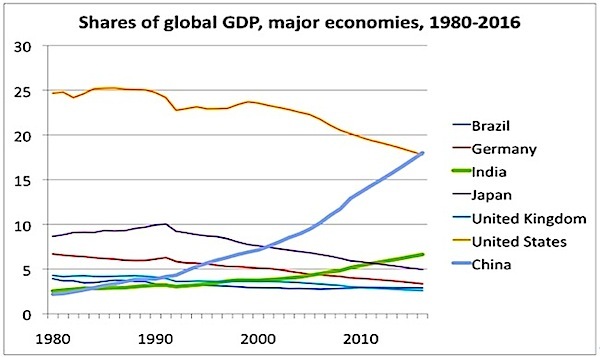 Despite its many problems, it's hard to dispute China's growing global economic power (chart below). For the remainder of our investing lifetimes, China will undoubtedly have the largest economy in the world (though not necessarily as influential as the U.S. economy) — and, as it reforms and liberalizes its mainland stock exchanges, it will certainly dominate the emerging markets stock indexes for decades to come. no one has understood China in its history....just look at history! PaddyMac wrote: I keep thinking of the 60 Minutes piece a year or two ago where Leslie S. walked through entire cities with freeways and skyscrapers and shopping malls with no one living in them (ghost cities in other words). Citizens bought real estate and speculated. It was appalling. You could see then that this was a faux economy. Looked like Ireland in the Celtic Tiger days but ten times worse. One of the financial publications, might have been Economist I don't recall did a re-walk though of the same places on Sixty Minutes piece and were bustling, more recently. It's really hard to evaluate the world in terms of over simple symbolism which appeals to the lowest common denominator, which is what general journalists naturally look for. Although, obviously, since then the A-shares market went through the ceiling and is now unwinding those gains. I think it was quite reasonable to be worried about A-shares bubble and spill over to broader world, not crystal ball viewing to *worry* about it. And both the 'ghost cities' thing even if overblown, and A-shares bubble both point to potentially very serious (for the world) issue of Chinese adjustment to slower growth, and/or ironing out all the distortions that have built up during breakneck growth and govt's attempts first to rein it in, now to prop it up. However in bigger picture it seems to me still hard to tell if this is more like the NASDAQ bubble burst (which had a pretty mild effect on world economy and markets relatively speaking) or multi-national housing bubble burst which had a much bigger one. And in terms of 'actionable', general news media pieces generally aren't too useful in that regard IMO. Seems like China's "rulers" are trying to create a capitalist economy ruled by Communist government control. Not sure that dog can hunt. Difficult to know for sure what's really going on in China. The Chinese government says the country's economic growth is still around 5% to 7% annualized, but estimates from Western experts say it may actually be lower than 2% - 3% per annum. Born and raised and I would never invest there. You can't believe any number out of China. Government, industry or corporate. It is all fiction. That is your starting point, everything else flows from that. 1. Many corporations are hollowed-out shells where the company officers have systematically looted the assets. 2. The Government publishes whatever number it needs to publish to meet its aims. As far as I can tell, there is no way of verifying the actual performance of any listed company in China (or ADR shares in the US). Is the entire economy of China a bubble? Who knows. How can you tell if you can't trust the corporate documents? Google "Zhongwang Group" for a recent expose' of one major Chinese corporation. EDIT: I say this as someone who has been doing business in China for more than a dozen years. David Jay wrote: You can't believe any number out of China. Government, industry or corporate. It is all fiction. That is your starting point, everything else flows from that. To some extend can't you say the same thing about US companies? Google things like Enron, Worldcom, the whole dot.com bomb, real estate sales in the 2006, and so on? When china's economy is doing great we will hear about how central planning allows them to outpeform market economies. When it is tanking we will hear about how corrupt and inefficient it is. The truth as always is in the middle. 4nursebee wrote: Is there an easy way to understand what is happening in the markets related to China? But this has happened in Emerging Markets before-- 1998 in particular. A property-financial bubble has built up. Companies and individuals were borrowing money and reinvesting it in property (and stocks) at far higher returns. Eventually this unwinds-- too many unlettable buildings are built, too many companies which are basically castles in the air are IPO'd, etc. There was that company that doubled its share price simply by changing its name to "China LNG" with no actual investment program in that area. On top of this local and regional governments became significant players-- they collect big revenues (and big bribes) from property developers. And the central government encouraged massive construction expenditure on infrastructure to fight the slowdown. Now this is all unwinding. Think of it like the US in 2008-09 but the overbuilding is general, not just the residential property sector. The empty cities and apartment blocks are just the most visible sign. You also have high speed trains that no one uses (the average wage earner cannot afford the ticket). Also the export miracle is off the boil. The Chinese currency has appreciated about 50% against the dollar in the last few years. The Eurozone is on the verge of recession. So with Chinese companies less competitive and big markets growing not at all or slowly, there isn't the usual impulse of export growth to keep things going. Hence the devaluation announced. But US companies aren't ALL Enron/Worldcom. They are the exceptions, not the rule. That is the difference. You are free to believe that the "truth is in the middle", but I respectfully disagree. As the US printed money to address the 2008/9 financial crisis, so also did other countries. Initially the new money bought government bonds, but when bond yields dropped so low some central banks opted to buy stocks with reasonable dividend yields. In effect some central banks evolved from being conservative stability mechanisms into being speculative Sovereign Wealth Funds. The risk there is that there's conflict of interest and if the risk of losses appear on the horizon then one central bank might opt to start dumping/shorting stock to hedge ... which could have a domino/knock on effect. The US and UK central banks avoided such stock purchasing. Speculative/over leveraged banks were bailed out by states/central banks. There's no fail-safe however to bail out over leveraged/speculative central banks. China holds a lot of wealth and has diversified across stocks, bonds and gold. Managed responsibly and they'll be stability. Managed speculatively and there could be all sorts of volatility/stress, potentially to their 'investment' benefit. Simplegift wrote: Completely agree. Despite its many problems, it's hard to dispute China's growing global economic power (chart below). For the remainder of our investing lifetimes, China will undoubtedly have the largest economy in the world (though not necessarily as influential as the U.S. economy) — and, as it reforms and liberalizes its mainland stock exchanges, it will certainly dominate the emerging markets stock indexes for decades to come. Too bad there's no correlation between economic growth and stock market returns! I think the most simplistic answer is that the Chinese government, fearful of slowing exports (negative 8.7% YOY), eased the peg on the Chinese yuan, letting it devalue on consecutive days last week. On top of this, there was a 47.1 print on their purchasing managers index (PMI). Anything below 50 is considered a contracting economy instead of expanding. The fear is that China is headed for a hard landing and, being the second largest economy in the world behind the US, what this could mean for the larger global economy. Best explanation that I found. However, there is a causal link between the 2. You need to shift out other structural issues. For example, the split of economic profits between workers, managers, shareholders, and the government. Market structure shifts that may favor small (and generally private) companies over large (and generally public). Changes in the real long term interest rates can have just as much influence as growing GNP in deterring asset price levels. etc. So single value correlation, no. Multivalve correlation yes. FYI, I am surprised at how far the Chinese economy has grown into a capitalistic one and I still think it will continue to grow in that direction. However, I still try to underweight China in my portfolio. While minority investor rights are increasing they are still at very low levels. Way more risk than I am willing to handle. In the last six years, private debt has grown to 80% of GDP and that's an official number which likely downplays the amount of debt. It helped China sail through our last crash. That's the fastest growth of credit ever. "China’s bubble drove private debt up by as much in 5 years as Japan managed in over 17 years, and more than the USA’s debt rose in the entire Clinton-Bush debt bubble from 1993 until 2010"
If I thought there was half as much fraud in the developed markets as routinely takes place in certain EM markets, I wouldn't be invested in stocks at all. However, China is far from the worst of the EM countries in publishing fraudulent numbers and for mid-level corruption, their justice system can certainly be more expedient. Their "trials" can be remarkably efficient. If you are asking "is there corruption in the U.S.," then the answer is, of course, yes. But far do you want to stretch "to some extent?" On Transparency International's corruption perceptions index, where 0 is highly corrupt and 100 is very clean, China scores 36, the United States scores 74. That's a wide gap. Just because the U.S. isn't perfect doesn't make the U.S. and China the same. Combine emerging market (political) risk with one of the world's biggest economies, and things are really dicey. I never thought it was a good idea to buy a Chinese fund or stocks. I'll stick with their weighting in Total International Index (currently 4.6%). 60 Minutes might have gotten it wrong. We don't need to resort to racial stereotypes to explain the big run-up and crash of China's mainland stock markets — especially in such a diverse, complex country with 1.4 billion citizens. In fact, the Chinese government encouraged its citizens to invest in the stock market, mainly by relaxing margin trading restrictions — ostensibly to facilitate the sale of stock in state-owned enterprises at higher prices, if one believes the market commentary. Simplegift wrote: We don't need to resort to racial stereotypes to explain the big run-up and crash of China's mainland stock markets — especially in such a diverse, complex country with 1.4 billion citizens. In fact, the Chinese government encouraged its citizens to invest in the stock market, mainly by relaxing margin trading restrictions — ostensibly to facilitate the sale of stock in state-owned enterprises at higher prices, if one believes the market commentary. No, you don't need to resort to racial stereotypes. However, I would point more towards market expectations. I can draw strong parallels between the current Chinese stock market and the US stock market 100 years ago. Heck, or even the US real estate market 10 years ago. Prices in the stock market are supposed to be set by the collective wisdom of the masses. However, what if rationality does not hold? What if the majority of investors treat the stock market as a gambling machine instead of a rational allocation of capital for investment? Won't the rational investor come out ahead, taking advantage of their unsophisticated counterparts? What if audit standards are low? What if stocks are prone to outside manipulation? Insiders, trusts, and special interest in the government? In the US there have been quite a few interesting stories out there – maybe none to the scale of China, but still. And there is a cross argument between gambling investors and novice investors - they are often the same people. Well, at that point it is kind of rational to treat the stock market as a gambling machine. size of its economy means the effects are felt world-wide. In chaos there is opportunity, both for advancement and decline. I'm too conservative to invest directly. The effects it has on the US market are enough of an exposure to me. Multiple posts, including several including offensive stereotypes, were removed. The thread is going to stay locked.